From arch-topped picture windows to the stunning balcony view, this elegant home is designed for privacy and pampering. A secluded area with no rooms above, the master suite is also highlighted with tray ceilings, while the central part of the floor plan uses columns to partition rooms without enclosing space. 1st Floor: 2140 Sq. 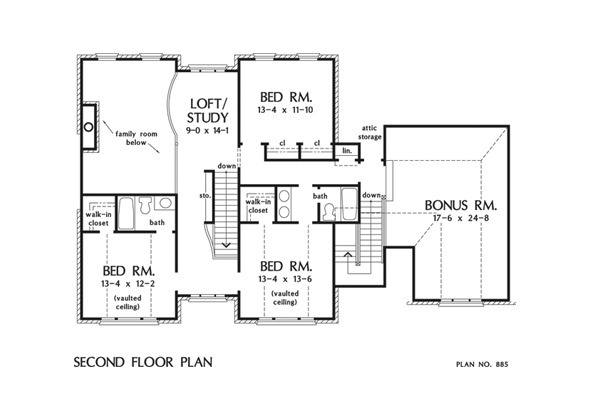 Ft.
2nd Floor: 1124 Sq. Ft. Bonus Room: 533 Sq. 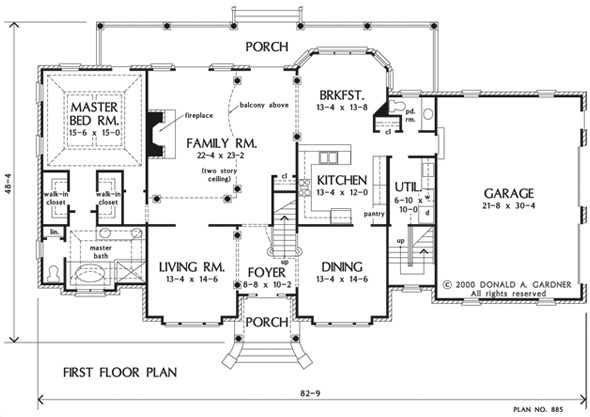 Ft.
House Dimensions: 82' 9" x 48' 4"
Great Room: 22' 4" x 23' 2"
Master Bedroom: 15' 6" x 15' 0"
Foyer : 8' 8" x 10' 2" x 9' 0"
Dining Room : 13' 4" x 14' 6" x 9' 0"
Great Room (2 Story): 22' 4" x 23' 2" x 18' 0"
Bonus Room (Vaulted): 17' 6" x 24' 8" x 8' 0"
Garage : 21' 8" x 30' 4" x 0' 0"
Master Bedroom (Tray): 15' 6" x 15' 0" x 11' 7"
Bedroom #2 (Vaulted): 13' 4" x 12' 2" x 12' 6"
Bedroom #3 (Vaulted): 13' 4" x 13' 6" x 12' 6"
Porch - Front : 8' 8" x 7' 0" x 0' 0"
Porch - Rear : 51' 7" x 7' 0" x 0' 0"
Loft / Study : 9' 0" x 14' 1" x 8' 0"
Living Room : 13' 4" x 14' 6" x 9' 0"
Other : 1' 2" x 7' 0" x 0' 0"